The front of the pack clearly shows the Red Back through the wax. A few years back I was checking out a card shop in Phoenix, Arizona when I stumbled upon a few unopened packs of 1951 Topps Red Backs. After some quick negotiation, I was able to add one to the collection. The 1951 Red Back set is Topps’s first set, and was originally a playing card game. The set consists of 54 cards (52 base cards plus 2 update cards). They were sold in two card wax packs with a price point of one cent. Pack dimensions are approximately 2 1/8 inches by 2 ¾ inches. 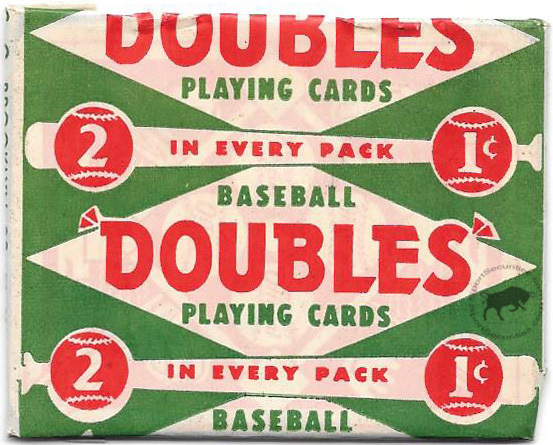 The packs are colored red, green, and white, and have the words “Baseball Doubles Playing Cards 2 in Every Pack 1¢” printed on them. These cards can also be found in a Blue Back version, but these are much scarcer than the Red Backs. To my knowledge, both the Red Backs and the Blue Backs come in the same wrappers but were distributed separately. 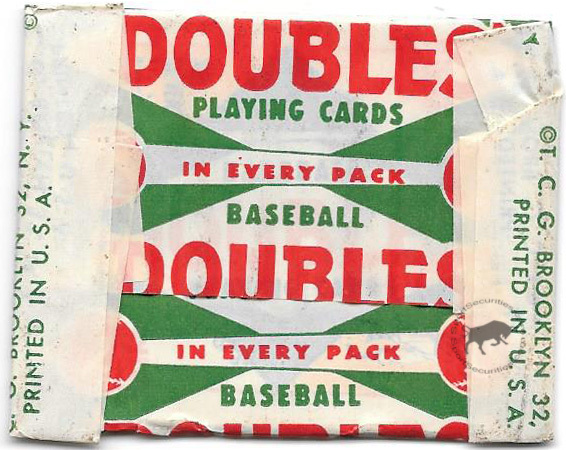 In the case of an unopened pack, identification of either version is easy because you can see the card backs through the front of the packs. Unfortunately, this also is true for the back of the wrapper, making pack searching a problem because player names can be read through the wrapper.